The design of the huge blades is inspired by by the way palm trees move in storms. The “trunk” of the turbine features a segmented build with a cylindrical shells that bend at the joints in the wind, while still retaining segment stiffness. The turbines themselves are called Segmented Ultralight Morphing Rotors (SUMR). They are lightweight, flexible, and assembled in multiple segments. At dangerous wind speeds, the blades are stowed, while at lower wind speeds, the blades spread out more to maximize energy production. While 50-MW is well beyond the size of any current design, studies show that changes in the design and placement of turbines may allow this mark to be reached. Pointing turbines downwind, unlike conventional turbines that are configured with the rotor blades upwind of the tower, shifts the load alignment so that stress on the rotor blades is dramatically reduced. Fewer repairs and less maintenance means lower costs, which could free up capital to construct blades big enough for a 50-MW system. Before designers can scale up to a 50-MW turbine, a size more than six times the power output of the largest current turbines, multiple barriers need to be resolved. Manufacturing, deploying and maintaining upwind blades is expensive. The blades must be stiff enough to avoid fatigue and to mitigate the risk of tower strikes due to strong wind gusts. Stiff blades translate to a higher mass. Researchers are working to produce the blades in segments to prevent the need for unprecedented-scale equipment to transport and assemble the blades were they to be built as single units. Giant turbines could be an important way to meet the Department of Energy’s goal of providing 20 percent of the nation’s energy from wind by 2030. Holinka, Stephanie. 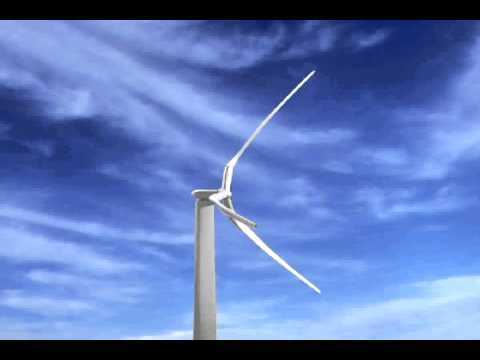 “Enormous Blades for Offshore Energy.” Energy.gov. Department of Energy, 8 Feb. 2016. This entry was posted in Uncategorized and tagged Cleantech, DOE, Exascale, National Laboratories, offshore wind, renewables, Sandia, Segmented Ultralight Morphing Rotors, SUMR, Wind energy by Emil Morhardt. Bookmark the permalink.